There comes a time in every woman’s life that they will experience an incontinence problem, whether it is just a slight leakage or a heavier flow. This can be an on-going problem or just a phase of life. Poise pads have been developed for the ever changing needs of women. Idiaper offers a wide selection of the products for coverage from light to heavy. They come in a variety of different lengths with difference absorbency values. There is a Poise pad for every stage of a woman’s life and needs. These pads are designed to be worn within your normal underwear for added protection where and when needed. They contain the barrier layer to prevent any leakage onto your undergarments or clothing. The Poise Extra Pads are extra absorbent for those with a moderate need. They are also available in different lengths and can hold almost a cup of liquid. The Poise Extra Pads are hour glass shaped to conform to the body for a better fit. They are available in different coverage ranges. 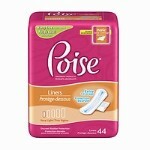 The Poise Maximum Pads are for those who require more absorbency. These pads will hold 2 cups of fluid. The have a super core that will lock in the fluid and a barrier shield that prevents leakage. The Poise Pantiliners are designed for women who have light leakage during the day. They are smaller and thinner with a center absorbent core that keeps you dry. The Poise Ultimate Coverage Pad has leak blockage side to prevent any leakage onto your undergarments and clothing. It has a dry lock layer to keep you feeling dry and fresh. The Poise Ultra Thin Pads have wings on the sides to help keep the pad in place with no slippage or traveling. They are for light coverage. The Poise Very Light Pads are designed to conform to the body with a raised center core to help keep you feeling dry and fresh. So no matter where you are in life, there is a Poise Pad available to fit your needs. There are a variety of reasons for women to require the use of a pad. The Poise Pads are designed to help during these times when a pad is needed. 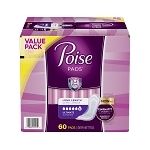 Poise has designed their pads for comfort, absorbency, and leakage control. They are compact with the center core absorbent for a woman’s needs. So whether you are experiencing a slight bladder leakage to something heavier, the Poise Pads will contain the fluid, wick it away from the body and provide odor control. They are also compact and can be taken with you while you are out and about taking care of yourself and others. The staff at idiaper’s Customer Service is there to answer any questions your may have about the product. With their years of experience, they can assist you in finding the proper product that will be correct for your needs and requirements. Give Idiaper a call or email us, don’t let a bladder control issue slow you down, or keep you from enjoying your life style.